Transmission – Fully Synchronized 16 forward x 16 reverse Power Shuttle Shift. 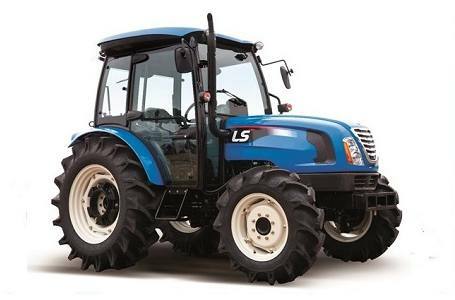 Modern Stylish Design - This 4WD utility tractor is ergonomically designed and stylish with its distinctive blue color. LS Tier 4 CRDI Engine – 4 cylinder low vibration, fuel efficient yet powerful. Large Fuel Tank – 21.1 gallon capacity provides long operation times. Power Shuttle Models - maximizes ease of use with effortless, clutch-less directional changes with the 16 forward / 16 reverse speeds. Hydrostatic power steering with tilt - makes turning easier, improves control and reduces fatigue and enhances comfort. Simple Selections - select your gear with simple move of the lever. 3-point Hitch with Extendable Lower Links Standard - Category 2 (U5030 models) with hitch lift capacity of 4,079 lbs. allows easier attachment of a wide variety of implements. Position and Draft Control with Automatic Lift - increases ease of use across a wider variety of implements. PTO Switch –Independent PTO turn on and off with simple turn of a switch. Deluxe Adjustable Seat with Retractable Seat Belt - keeps you in a comfortable even during long operations. Comfortable Cab Models - offers unobstructed view in AC/heated comfort and includes interior lighting, front & rear wiper/washer, side mounted mirrors deluxe AM/FM/CD Stereo. Flat Platform – with rubber mat and side mounted gear lever, maximizes space, improves operator comfort, and makes getting on/off tractor easier. 2 Sets of Remotes Standard - adds functionality and improves ease of use by allowing attachment of hydraulically controlled implements without the high, additional costs like others in its class to add the remotes as options. Your Choice of Tires - choose industrial or Ag tires at no additional cost. Optional Quick Attach, Self-Leveling Front End Loader with Skid Steer Compatible Bucket - easy to take off or attach loader and easily change loader attachments. With 2,981 lbs. of lift capacity it outperforms others in its class. Grill guard comes standard with loader rather than an option like others in its class. Optional Quick Attach Backhoe - remove or attach in seconds. With 94” digging depth, 3,748 lbs. of digging force and 180° swing arc, it outperforms other in its class. Overall length with 3pt: 138.6"
Min. overall width with Ag tires: 70"
Height to top of Cab with Ag tires: 100.6"